Download "Address: 2104 Londondery Dr. Date of Birth: May 16, 1958 Manhattan, KS 66503"
5 23-24, 1998 (Purpose: To evaluate and provide recommendations with regards to the business operations of the Speech and Hearing Center). University of Arizona (Tucson), The University of Arizona Speech and Hearing Center. 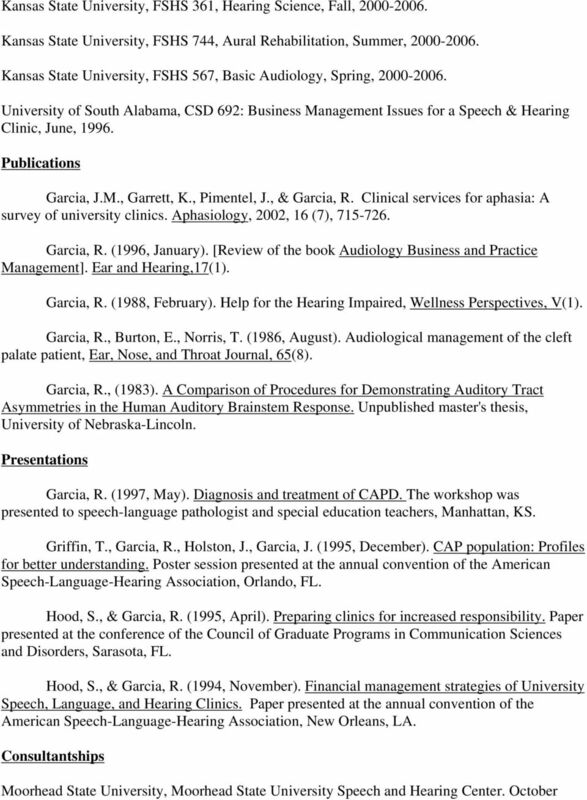 June 22-23, 1995 (Purpose: To evaluate and provide recommendations with regards to the business operations of the University of Arizona Speech and Hearing Center). NOVA Southeastern University (Fort Lauderdale), Communication Disorders Clinic. 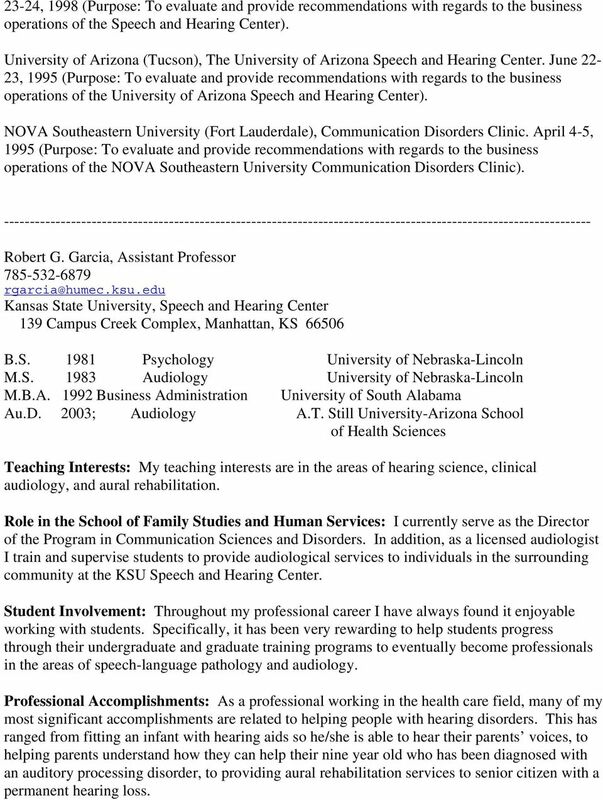 April 4-5, 1995 (Purpose: To evaluate and provide recommendations with regards to the business operations of the NOVA Southeastern University Communication Disorders Clinic) Robert G. Garcia, Assistant Professor Kansas State University, Speech and Hearing Center 139 Campus Creek Complex, Manhattan, KS B.S Psychology University of Nebraska-Lincoln M.S Audiology University of Nebraska-Lincoln M.B.A Business Administration University of South Alabama Au.D. 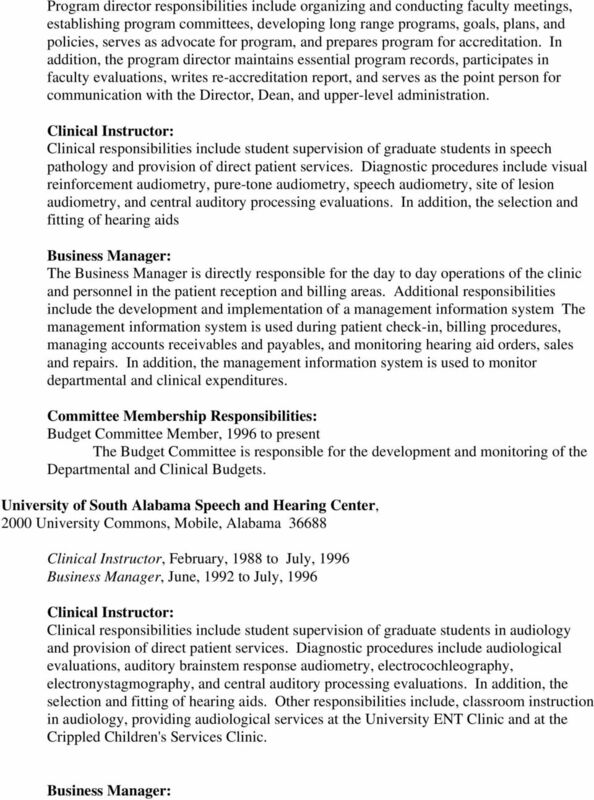 2003; Audiology A.T. Still University-Arizona School of Health Sciences Teaching Interests: My teaching interests are in the areas of hearing science, clinical audiology, and aural rehabilitation. Role in the School of Family Studies and Human Services: I currently serve as the Director of the Program in Communication Sciences and Disorders. In addition, as a licensed audiologist I train and supervise students to provide audiological services to individuals in the surrounding community at the KSU Speech and Hearing Center. Student Involvement: Throughout my professional career I have always found it enjoyable working with students. Specifically, it has been very rewarding to help students progress through their undergraduate and graduate training programs to eventually become professionals in the areas of speech-language pathology and audiology. Professional Accomplishments: As a professional working in the health care field, many of my most significant accomplishments are related to helping people with hearing disorders. This has ranged from fitting an infant with hearing aids so he/she is able to hear their parents voices, to helping parents understand how they can help their nine year old who has been diagnosed with an auditory processing disorder, to providing aural rehabilitation services to senior citizen with a permanent hearing loss. 6 Brief Background: I was born in Oakland California, but grew up in a number of different cities located on the west coast, in the northwest, and in the midwest. I completed high school in Omaha, Nebraska and attended college at the University of Nebraska-Lincoln. 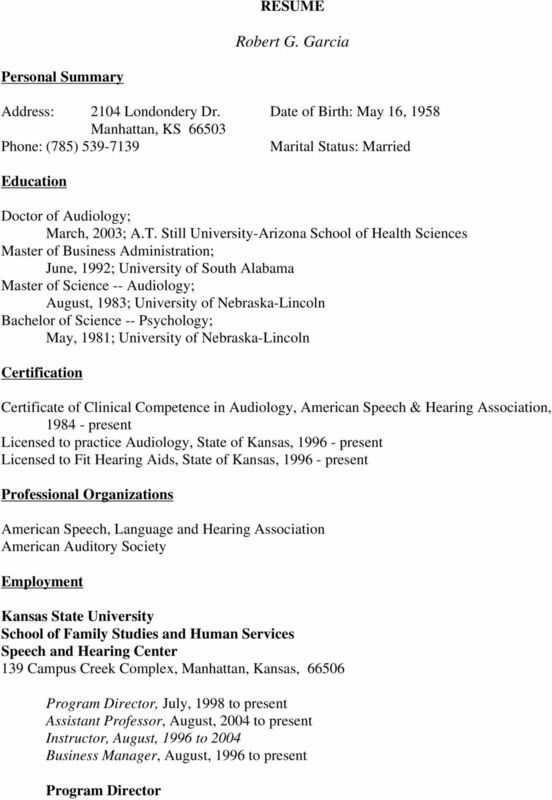 During my professional career as an audiologist, I have had the opportunity to work in a number of different settings. This includes working at a Veterans Administration Hospital, University Medical Center, and University training programs. I am married to a fourth generation graduate of KSU and therefore our household is required to always root for KSU, even when they play Nebraska. 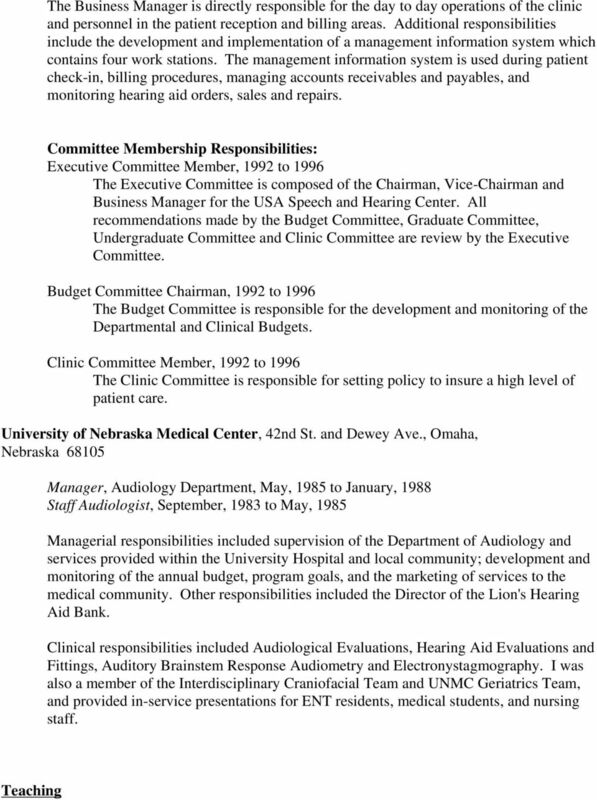 CURRICULUM VITAE James L. Vincent The Therapy Center Phone: (316) 636-1188 7807 E Funston St. Fax: (316) 636-1190 Wichita, Kansas 67207 E-mail: DrVincent@therapycenterwichita.com EDUCATION: 1996 Ph.D.